There are three major terms one needs to understand when approaching the question of the reliability of the scriptures. These terms are Inerrancy, Infallibility and Inspiration. One common misunderstanding is that inerrancy and infallibility are the same thing. To further complicate this issue, there is no “official” and universally accepted definition for the word “inerrancy” when used in reference to the scriptures. Nevertheless, these two terms, are most often treated differently, with infallibility being a far more foundational doctrine, with far greater implications than inerrancy. For some, inerrancy means that the entire bible was dictated out of the mouth of God to stenographers who dutifully represented every word with the exact spelling and perfect grammar of the Almighty as He slowly spoon fed them what to write. To others it means that it is error free in its conveyance of historical information. To others still it means the bible is clear and accurate concerning all the topics it touches. Finally, inspiration means that the scriptures are accurate in what they convey. Inspiration, when used in context with the Holy Bible, means that God directly influenced the writers with the thoughts He was wanting to convey. As a result, “inspired” writers accurately delivered the specific meaning of what God wanted to say, but had lateral freedom in HOW it was said. This is why you have agreement between books like Isaiah and Amos – even though their individual writing styles, grammar and word choices could hardly be more different. Perhaps one last example for the purposes of clear representation. The Gospel of Mark is very poorly written and uses the Greek version of “street language” to communicate the Gospel. Any first year translation student of Greek could tell Mark’s gospel apart from the others without even being familiar with them, since Mark’s grammar and writing style is so bad. This however, should not embarrass or challenge the faith of any Christian. God chose this young man to proclaim the good news of His Son in a way that would speak to the masses of everyday people of his time as well as bless generations to come. The touch of humanity doesn’t impact inspiration because the scriptures are focused on ‘what’ is being communicated, not ‘how’ it is being said. In fact, this actually adds to the authenticity of the message. In determining the reliability and genuineness of a person’s testimony in a court case, what they say is compared with the testimony of others. IF what they say is nearly 100% the same as the testimony of someone else, it actually casts doubt upon their word. Humans do not see things the exact same way and this effects their testimony. Matthew views and writes about Jesus as the Lion of the tribe of Judah in all His royalty. Luke was a Gentile doctor and viewed Christ as the God-MAN. He represents Jesus as loving the the whole world and ministering to their needs especially making mention of Gentiles, women and those who were outcasts. Luke includes many of the parables not mentioned in the other Gospels. John represents Christ as an eagle – high, majestic and Deistic. John focused more on the intentions of Christ in His actions rather than upon the actions themselves. He made use of many words which pointed to the Deity of Christ – like glory, life, light, love and truth. In John’s eyes Jesus is portrayed as God. Not one of these Gospel writers are incorrect. They all see the truth of Christ, but WHAT they see and how they represent it is unique to the writer. THIS is inspiration! It may surprise you to learn that having the original scriptures is NOT the only way we can know if the scriptures we have are reliable. In fact, there is no credible historian or literary scholar who would require the originals in order to meet the qualifications of verifying authenticity. Personally, I believe that God deliberately has seen to it that we DO NOT have originals because the church would have enshrined them and worshiped them rather than read them. In regards to the Scriptures, we possess something FAR more valuable and reliable than “originals”, and that is THOUSANDS upon THOUSANDS of copies. This is invaluable for verifying authenticity and accuracy! In the case of the New Testament Scriptures, many of the texts we have were written in the first and second century and all of which agree on nearly every single point! This makes the New Testament a veritable gold mine in terms of textual validity. Why would copies be more valuable than originals? For many reasons! Perhaps the most important is that there is virtually no way to verify if any document of antiquity is an “original”. To do this, we would have to be able to verify the handwriting and that no identical document was ever penned prior to the one in question. While verifying handwriting is not impossible, there is no way to be 100% certain that no identical parchment predates the one we have in our possession. ➢ Do any challenge any long held, foundational doctrinal beliefs? Absolutely NOT! For the Old Testament we have a VERY clear record of the scribing process and near 100% agreement across all the copies produced. The highest testimony to their validity, in my view, is that Jesus Himself relied upon these copies as trustworthy in that He preached largely from the Septuagint – WHICH WAS BOTH A COPY AND A TRANSLATION INTO ANOTHER LANGUAGE! The language the Hebrew scriptures were translated into was Koine Greek. Koine means “common”, so the Ancient Hebrew scriptures were translated into “common” Greek by those who spoke and wrote both languages fluently. This is invaluable for many reasons, the primary being that it offers us a clear basis for better understanding ancient Hebrew since Koine Greek is still very well understood today. it was the “version” of Greek in “common” use from the time of Alexander the Great until well past the time of Christ. As for the New Testament, we have over 5,700 ancient Greek copies and growing! There are 10,000 copies in Latin also. Additionally, we have at least 10,000 more in other languages such as Coptic, Syriac, Armenian, Georgian with most of them being complete copies, though some are just fragments. Truth be told, there is MORE proof to biblical infallibility and inerrancy than ANY OTHER historical document BY FAR! 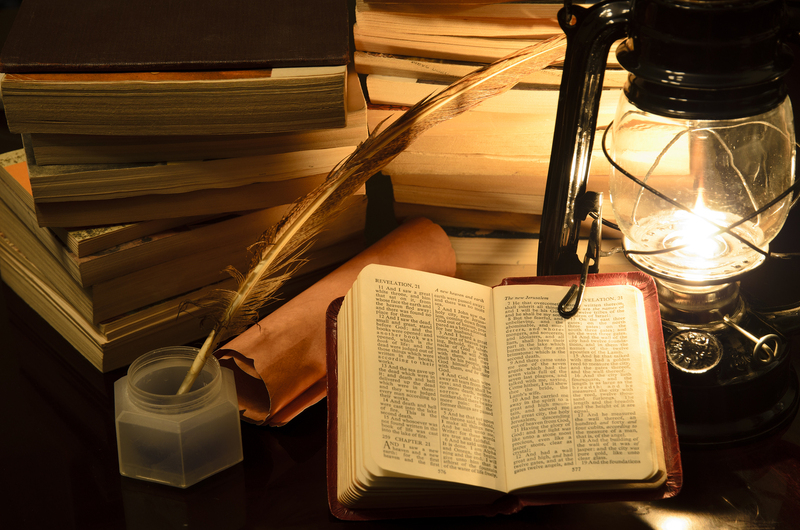 Contrary to what the popular media and Hollywood would have you believe, the basis we have for the authenticity of the New Testament has become a type of “industry standard” for ascertaining the accuracy of other historical writings. It is THAT reliable! The copies we have, and the overwhelming harmony in the content between them, is nothing short of miraculous. If the solid reasons we have at our disposal for confirming the reliability of the information the Bible contains were commonly known there would be far less doubters and virtually NO scoffers. Many people do not know that, but it is the truth! Most secular ancient Greek texts have fewer than 20 copies of the now non-existent originals and these were almost never recorded until 500-1000 years AFTER the original was penned! Not so with the scriptures! Most of the copies we have of the originals were written DURING THE LIFE of their authors or those who had read the originals, which gives their authenticity a tremendous boost! For example, if false doctrines were around in Paul’s day – he addressed them – especially when they were misquoting him. Yet, we do not have a single account of Paul or James or Peter or John…etc. warning against copies of their letters containing doctrinal errors. In fact, the opposite is illustrated in one of the letters of Paul to the church of Thessalonica. Notice, a doctrine (teaching) which was contrary to the inspired doctrine Paul taught had come to this church and Paul addressed it. Furthermore, that such a false teaching may have come in the form of a letter seems apparent by the verse…“we ask you not to be soon shaken in mind or troubled, either by spirit or by word or by LETTER, as if from us.” This serves to illustrate my point. If Paul addressed false doctrine that was not presented as “the word of Paul”, then how much more certain is it that Paul would be diligent to correct errors in teaching that were presented as coming from him? Many of the letters in the New Testament were called ‘circuit letters’. This is because while they were originally written to a specific city-church or group of churches in a region, they were also circulated throughout the all the early churches for purposes of establishing sound doctrine. Now, it is naïve to think that these circuit letters were literally carried from one church to the next so that each might have a turn at the original. No, many times these letters were copied and sent to other churches throughout the ancient world – THAT is where we GOT some of the copies we have today – they were produced right under the noses of those who penned the originals! One of the first things you will hear from those who question the reliability of the Scriptures is that it they are copies of copies. Traditionally this is where someone misguidedly brings up, “The Telephone Game”. This comparison however is, to borrow a common aphorism, comparing apples with oranges. For those of you who are not familiar with this entertaining party game, let me explain it. The “telephone game” consists of a single line of people all of whom are whispering sequentially from the “original” person to the ear of the last in line. So that the “original” is never given to the group all at once, but to one person at a time who in turn tells the next person. Whatever phrase was originally spoken, often becomes distorted by the time it reaches the last in the line. When the last person announces what they heard, those at the front of the line many times hear little resemblance between what they were told and what the last person announced. Now, to be fair, the game would be no fun if the phrase did not get distorted in some way. The humor comes from how badly the original gets distorted by the time it reaches the last ear. This encourages mistakes for the sake of fun. Scribing on the other hand is not a game and does not become humorous if the resulting copy bares little resemblance to the original. The process of scribing is RADICALLY different than the party game “Telephone”. While the game of “telephone” is a test of verbal memory from an original source through multiple people in succession to the last, textual scribing deals with WRITTEN tradition from multiple sources to a final copy which has a corrective effect on any errors. While “telephone” is a poor comparison, there is a more reliable test to demonstrate the process. My introduction to this “game” was through reading an interview with Daniel B. Wallace,1 Professor of New Testament studies at Dallas Theological Seminary. The game is called the Textual Critic game and has been used as a way of illustrating how textual criticism can succeed in reconstructing texts which are missing parts & pieces. This is of course a more severe situation than scribes typically dealt with since they nearly always had a complete copy of a text or several texts from which to draw. In this game, untrained people served as scribes. Their job is to copy out a text to be submitted to a group of make-shift textual critics. There are several generations of copies from which to make their copy. Nearly all of the scribes make mistakes, some intentionally some unintentionally. This only adds to the value of the game in that these copies are always more corrupt than any of the ancient copies of the scriptures. To illustrate this with real figures, consider that in a 50 word document these “scribes” were able to produce hundreds of textual variants. Later these are submitted to the “textual critics” in various groups. These do not have the benefit of any other text and there are many breaks in the chain. Their job is to come as close as possible to what the original text said. After having played this game over 50 times in churches, colleges & seminaries, they have never failed to reconstruct the original by less than three words and that only happened one time. There are of course, always doubts like whether a word should be translated as too versus also, but the original meaning remains unaltered and in most cases the text was recovered exactly. This demonstrates very effectively how powerful textual criticism is in recovering texts which are badly damaged or missing parts. If a group of people who know nothing about the process can reconstruct a document which is missing key components and is poorly preserved with that high of accuracy, we have great room for confidence in seasoned textual critics who are working with very well preserved ancient texts of the Bible. “Quite simply, we have more witnesses to the text of the New Testament than to any other ancient Greek or Latin literature,” Daniel B. Wallace. Of course the media LOVES to report variations in the scriptures as errors which fundamentally call into question everything the Holy Bible says. After all, it is “news”. No headlines are made if someone says, “We’ve placed the text of the Bible through as many arduously stringent tests for authenticity as textual criticism has to offer and you know what – the Bible we have is over 99% accurate and no doctrine has been compromised over the centuries.” No, what makes news is, “there are over 400,000 textual variants across thousands of copies so that we actually have no way of knowing what the original authors were trying to say.” Like the lies of satan, there is some truth to the statement, but the conclusion it is leading you to make is completely wrong! The media LOVES to call the validity of scripture into question! Most the things reported by the popular media as errors however, are actually variants, which is an altogether different matter! There are in fact, anywhere from 200,000-400,000 variants in scripture. Now I know what you are thinking…anywhere from 200,000 to 400,000? Which is it? Isn’t that a rather large gap? Well, yes it is, but that is due to how different scholars and textual critics define “variants”. If you take the larger number of 400,000 as accurate, nearly 320,000 of them are simple differences in spelling where the intended word is still clearly understood. To be clear, that is a full 80% of the reported errors are simply a matter of spelling. If you are a person who holds to the idea that all scripture was recorded by means of dictation, then this presents a very real and insurmountable problem. This is NOT a problem however, for those who understand inerrancy as accurately conveying the intended thought of God – rather than His spelling and grammar. A large portion of the additional variants are genuine mistakes but where the meaning of the passage in question is still quite clear. An example of this is the word Kai which means ‘and’ being scribed in place of the word Kurios which means Lord. The sentence makes it clear that the word ‘and’ does not belong there and the context makes it clear that it was the Lord Who was the person being referenced. I think the intended text is pretty clear, even though you are probably not a linguist nor a textual critic. So while errors like this really have occurred in the copies we have from antiquity, they are the type of errors which nearly anyone could correct with 100% accuracy. Of the remaining variants there are a large number of synonyms, which, though they are clear as to who they are referencing, it is still considered a variant. An example of such a variant would be a sentence like, “Jesus knew” versus “the Lord knew”. Both meanings are identical, but the word variation is “considered an error” by some because a proper noun was replaced with a pronoun representing the same person. This accounts for an additional 76,000 variants of the original 400,000. We have 320,000 spelling variations + 76,000 synonym variations….this equals 396,000 of the possible 400,000 variants – all of which are simple variations which transfer ZERO impact on the meaning. This leaves 1% of the variants which have a chance of effecting meaning in any way. Already, the numbers of errors, variations and claims of misinformation reported in popular books like Ehrman’s “Misquoting Jesus“, by poorly written documentaries like Religulous by Bill Maher and major Hollywood movies like The Davinci Code by Ron Howard can be seen in their genuine light as being far less questionable than they were purported to be. Earlier I asked, “Do any of these differences effect HOW we live the gospel?” To which I said, “One or two at most”, and these are actually identified as discrepancies, in most modern Bibles either as a footnote or a side note. If you read your Bible at all, you have without question read over or past them many times without ever noticing. Below, I will address the “worst of the worst” and let you be the judge or how much they effect the doctrines brought to us in the Holy Scriptures. The most famous one which could do the most damage – is of virtually no consequence at all. The passage is found in Mark 9:29 and though it actually does not affect doctrine – it “could” affect practice and that alone is what makes it stand out as the VERY WORSE. This is the verse, Jesus addressed His disciples about a unique deliverance from demonic possession. Many copies only have, “This kind only comes out by prayer” while others have “This kind only comes out by prayer and fasting”. While it could be argued that fasting is a type of prayer and therefore is not a discrepancy at all, I believe it is still a clear example of variant that could affect the practice of casting out certain demonic spirits. This one discrepancy is considered the most embarrassing textual variation in all of the copies of scripture. I don’t know about you, but I’m already feeling MUCH better about the reliability of my Bible! In the end, the question is – has any doctrine, whether minor or major been altered by this discrepancy? I would argue against it being a problem IF one truly follows the teachings of Christ. You see, Jesus Himself told the pharisees of His day that when He departed, His followers would fast – Matt. 9:15. Clearly Jesus intended fasting to be a regular practice in the church, however, it is one teaching of Christ which most Christians largely ignore. If however, they took the words of their Lord seriously and did as He said, casting such a demon out by prayer would be all that was required, since they would be those who already fasted often. Such being the case, no doctrine nor Christian practice is actually challenged at all. In closing I will offer two other examples which, while they are substantial, they do not really effect the overall message of the gospel which is why I still hold that there is in all reality only one major discrepancy in scripture. The things taught in these two passages are clearly stated in other passages or it is clearly demonstrated in the life of a New Testament persons so that the net result is that these discrepancies transfer 0% impact on the doctrines of scripture! The entire latter section of Mark 16 which do not appear in MOST of the copies of Mark and is considered by MOST as having being added to the original. Specifically the verses in question are 9-20. The example of the woman caught in the act of adultery – John. 8:7. This later example is sad to be sure because it is arguably one of the most beloved scriptures of the New Testament. That having been said, there is nothing about the passage that points back to the original and it is clear to any qualified textual critic that it was without question added to the content of the originals in some copies. While it is clear that Jesus most likely did something ‘like’ this in His ministry and that subsequent examples of the type of forgiveness this passage illustrates are abundant in the New Testament, the actual story itself cannot be relied upon in its details. I have just demonstrated to you the VERY worst of the worst, in terms of discrepancies and these really do not affect any New Testament doctrine for living whatsoever! They also, do not pose a problem if you hold to the definition of inerrancy and infallibility that states that the scriptures are true in what they touch and teach in terms of doctrine. Nor does it call into question inspiration since what God intended to be conveyed to man through the scriptures are not in any way challenged by there addition nor subtraction. For the purposes of this article I drew heavily from the book, The Case for the Real Jesus—Student Edition ©2008 by Lee Strobel, published by Zondervan, 5300 Patterson Ave. SE, Grand Rapids, MI 49530 ISBN 978-0-310-28323-2. • Postdoctoral study at Tyndale House, Cambridge, as well as at Tübingen University and the Institut für Neutestamentliche Textforschung, both in Germany. • Coauthor of several books, including Reinventing Jesus. 2. See Strobel, The Case for the Real Jesus, Student Edition (PDF), Challenge #2 pg. 55.